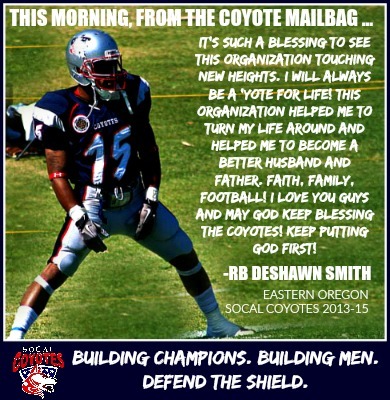 The SoCal Coyotes organization reshapes lives, homes and communities by Building Champions, Building Men™. It ‘Defends the Shield™’ through year-round ‘Faith, Family, Football™’ leadership programs, community service and sports initiatives that develop aspiring football athletes; educate, equip and inspire at-risk youth; nurture single fathers and father figures; extol the virtues of family values, positive fathering and family legacy; mentor young men into trusted corporate citizens with employment opportunities and sustainable incomes; and empower future generations throughout the Coachella Valley. America’s #1 Developmental Pro Football Program™. For the past six years, the SoCal Coyotes non-profit sports leadership organization scalable model has become the national standard for professional developmental football. This footprint was built on industry-leading commitment, vision and initiatives. Now the fastest-growing sports brand in Coachella Valley history, the year-round SoCal Coyotes have no peers, and their impact is unprecedented. The Coyotes enjoy a broad array of powerful corporate partners, including the City of Indio – home to nearby Coachella, the nation’s largest outdoor music festival. 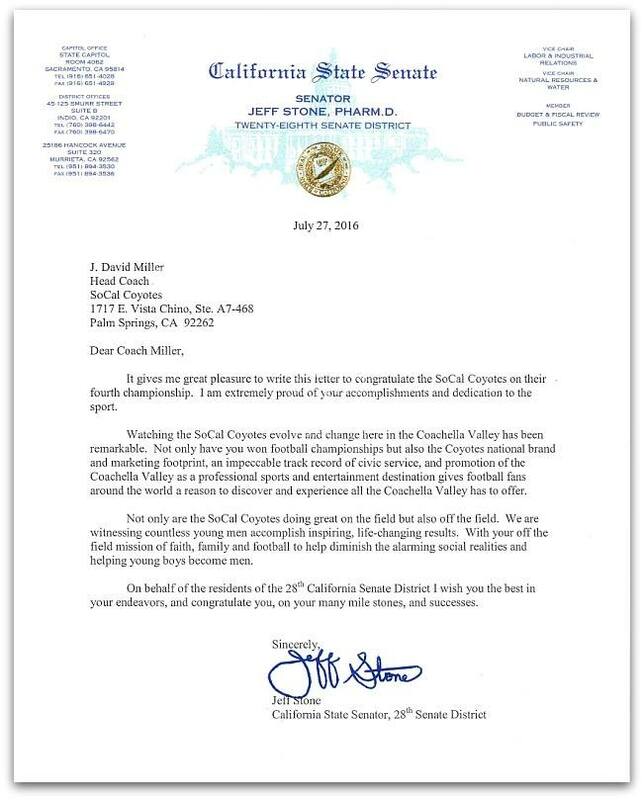 Indio Councilman Glenn Miller and California State Senator Jeff Stone are among many vocal Coyote advocates. They are now among an army of followers, fans, community dignitaries and corporate partners who share the Coyotes’ vision of a year-round, multi-million-dollar, world-class sports complex and youth development mecca. As our national spotlight gets brighter, our wish is to keep this attention focused on a Coachella Valley that offers hope, promise, and intrinsic value for every child raised in its corridor. 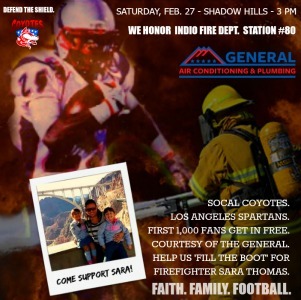 The SoCal Coyotes generously support Shadow Hills, their home since 2015. 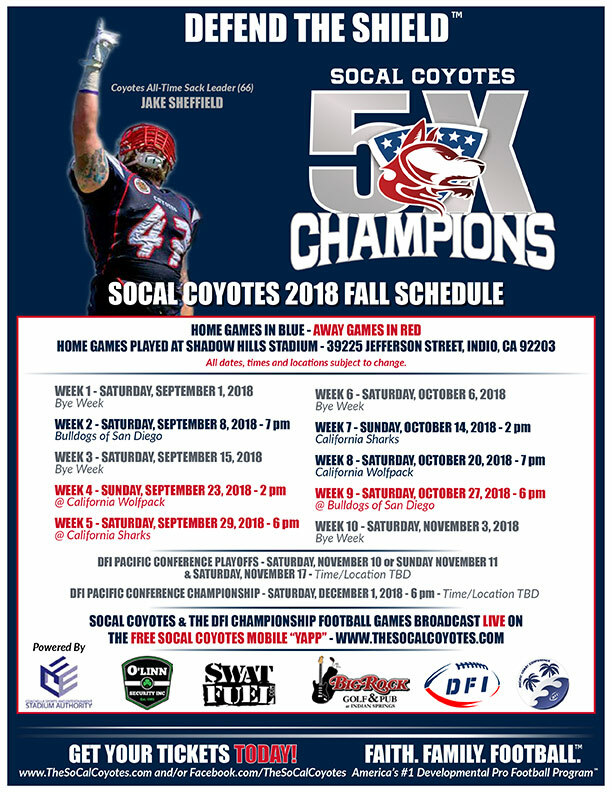 The five-time champion Coyotes accomplish their annual goals through the platform of developmental professional football. Coyote executive leadership is stocked with NFL wisdom, including legends such as Lynn Cain and Brad Budde. Revered NFL agent and sports attorney Jack Mills serves as counsel. For the 2018 season, documentary filmmakers are – for a second year – embedded with the team. QB Nate Lewis (2012-14) is the Coyotes all-time passer – with 10,027 yards and 98 TDs. More than 500 young players have matured through the Coyote program, with many advancing to camps in the National Football League, Canadian Football League and the Arena Football League. Dozens now live in and around the Coachella Valley and surrounding Riverside County, supporting and raising families, earning gainful incomes, and lead their schools, churches and communities. Defend the Shield: Faith, Family, Football. Their logo depicts a snarling Coyote who viciously ‘Defends the Shield,’ which represents Faith, Family and Football. 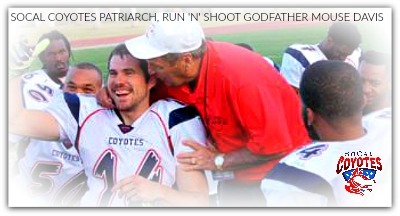 Coyote players are frequent speakers and volunteers in local schools, businesses, churches and charities. Among football teams, the Coyotes challenge their players to “lead the nation” in prayer, as well as wins. Coyote mentors apply faith-based initiatives in their lives and homes, and encourage them daily to be better fathers, better husbands, better men. “We have yet to meet a young man whose life is ruined because he prays too much,” says head coach J David Miller. Since 2012, the SoCal Coyotes have been a ‘conveyor belt to manhood,’ impacting the epidemic of absent fathers by mentoring, equipping and navigating young men. 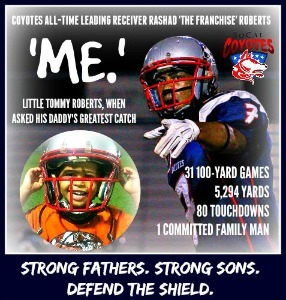 The Coyotes were founded for the two-fold purpose of a developmental professional football platform that also addressed the Coachella Valley’s vacuum for positive male role models, reliable fathers and father figures, and employable young males who are strong community servants and leaders. 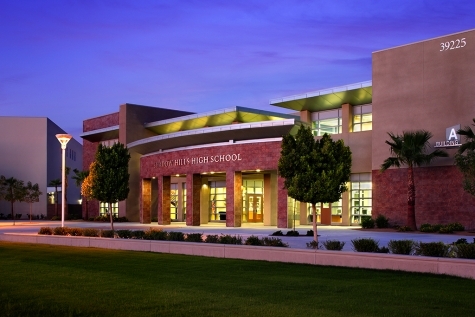 More than 150,000 Coachella Valley middle school, high school and at-risk youth have participated in Coyote Leadership clinics and learned from our curriculum. Across the desert, Riverside County law enforcement agencies, schools, districts, non-profits and civic organizations all benefit from our myriad of programs, clinics, symposiums and community development. Upwards of 30,000 youth each year are affected by our leadership curriculum alone, including special emphasis to at-risk, unprivileged, minority and displaced children. Local middle schools depend on our ‘Above the Line’ leadership programs to nurture, motivate, and prepare a successful flight path for their students. Coyote Leadership Pro grams are blueprints for attainable progress that provide schools, communities and organizations measurable results. 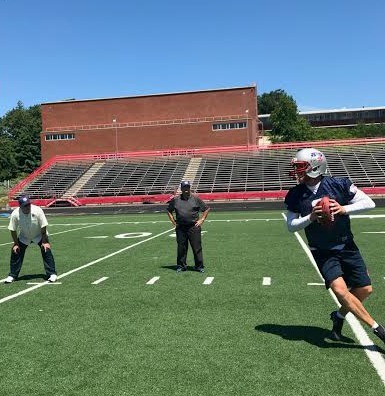 Other services range from educational classes, employment programs, motivational leadership symposiums, coaching clinics and intramural football. The Coyotes Head of Household Work Leadership program (HOWL) trains players in demonstrable skills that produce sustainable incomes, and matches them with employment opportunities. The Partners United Parents program (PUP) trains young fathers to co-parent with disciplined skills as dads and/or husbands. Who Else Benefits From The SoCal Coyotes. On the field, 70 players annually earn the distinction of ‘Defending the Shield’ in the uniform of the SoCal Coyotes. Many will graduate each year into professional football or local careers. The Coyotes raise funds and donate thousands of dollars annually that affect every desert community. 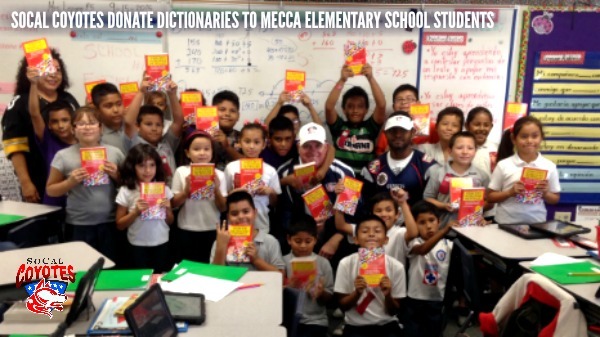 Coyote programs reach thousands of youth through coordinated efforts with numerous local charitable and civic organizations, including Boys & Girls Clubs, the YMCA, the Desert Strength Academy, the Boys & Girl Scouts of America, and Rotary International. 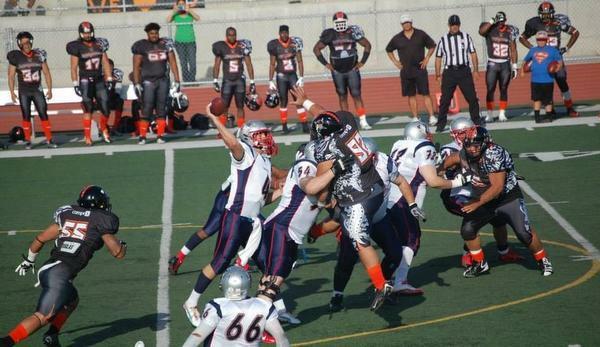 The Coyotes play a full season of professional developmental football each year. 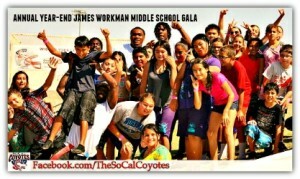 Coyote events are often used to raise significant financial support for area schools, sports programs and non-profits. Off the field, the Coyotes host an area middle school leadership event at least once a month during each calendar school year. The Coyotes host secondary achievement events at each of these schools. The Coyotes host a tryout camp each February that attracts 200 local youth. The Coyotes host two annual kids camps, in February and August. The Coyotes host an annual public middle school track meet in March, with 2,000 participants. Head Coach J David Miller. J David Miller has a career record of 129-23 (.882 winning percentage) and is 80-13 with the SoCal Coyotes. Coach Miller is a AAA Hall of Fame coach, best-selling author and award-winning marketing and communications strategist. In spring 2015, Miller was named APFL Coach of the Year by his peers; then LCFL Coach of the Year again in fall 2015. In 2013 he was named Southern California Football Alliance Offensive Coach of the Year. In 2012, national news sources selected him as AAA National Coach of the Year. He has led the Coyotes to three undefeated seasons, seven consecutive bowl appearances, five league titles, and a national champion runner-up. Coach Miller has experience at every level of football and his teams have never missed the playoffs. Currently the Coyotes are riding a 27-game win streak that dates back to 2015, with victories over 11 previously unbeaten teams, five league champions, and four Top 10 nationally ranked teams. Coach Miller has authored 13 books, including collaborations with NFL Hall of Fame and Super Bowl winner head coach Hank Stram, NFL head coach Jerry Glanville, legendary University of Hawaii head coach June Jones, and current University of South Carolina athletic director Ray Tanner. Mouse Davis, Run ‘n’ Shoot Silver Stretch, with Hawaii Roots. Coach Miller is quick to credit his success to his mentors, and clearly draws from their experience. His two greatest influences have been Darrel “Mouse” Davis and June Jones, both notable NFL and NCAA history-shapers. Davis, the godfather of the Run ‘n’ Shoot offense, is credited for revolutionizing the game with what is now the modern spread offense. Miller and the Coyotes have unleashed their vaunted Run ‘n’ Shoot attack to lead six different leagues in total offense. Jones, the former NFL and SMU head coach, worked with Coach Miller on Hawaii Warrior Football: A Story of Faith, Hope and Redemption. The best-selling book details how Jones transformed the nation’s dead-last NCAA program into a perennial powerhouse. 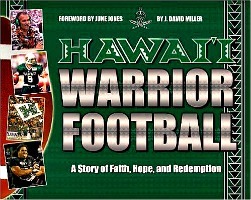 Under Jones, Hawaii enjoyed a decade of unprecedented success never before or since seen, and the book rocketed to the ‘most authoritative and significant book’ in UH football history. Four-time Super Bowl winner and former Washington Redskins GM Bobby Beathard calls Hawaii Warrior Football “required reading for building a winning program,” and the Coyotes use it as a template for the entire organization. Offensively, the Coyotes are adamant to remain a “pure” Run ‘n’ Shoot team, based strictly on the disciplines and concepts of Davis, whose theories date back to 1962. Davis is a frequent consultant and influence to the Coyotes, personally authored the Coyote playbook, and visits their sidelines, camps and locker rooms. 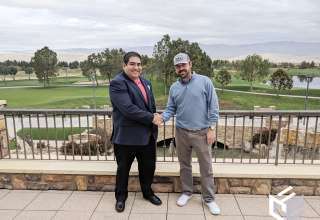 -Nicknamed “The Pride of the Desert,” the five-time champion SoCal Coyotes are the oldest pro football franchise in the Coachella Valley and have won more games in their first nine seasons of play than any football team at any level in desert history. 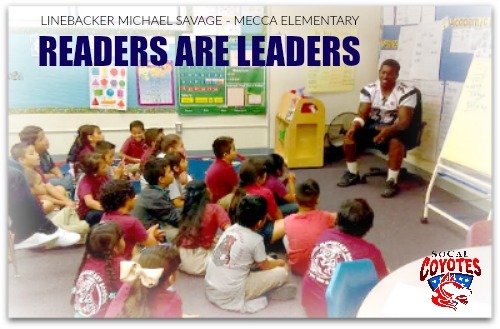 -The Coyotes are committed to “changing the culture” of developmental professional football through player mentoring and development, organizational management and dynamic service to their community. -The Coyote Leadership curriculum and their widespread volunteer efforts now daily impact churches, schools, civic organizations and communities throughout Southern California.